Pay attention to the warning on the box! 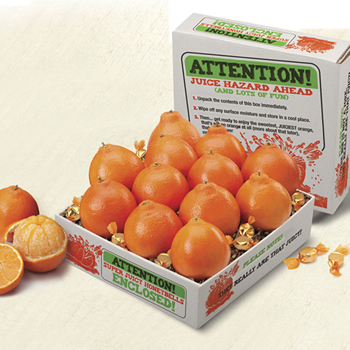 Dive into a box of amazing Honeybells. 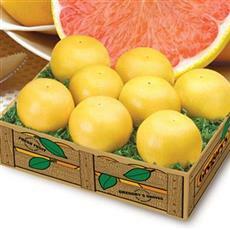 There are twelve of these juicy giants in every gift, along with sweet little Honeybell candies. 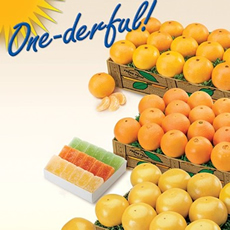 They're the best, sweetest, juice-packed Honeybells that Florida has to offer. They'll be as happy as can be with this super juicy gift! 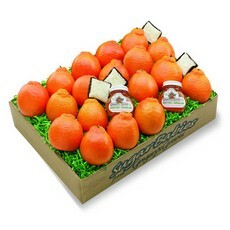 Send a gift of Honeybell Tangelos for the Holidays! Order your Honeybells right now. Gregory's will send a special card that announces "Your Honeybells will arrive in January." Why January? Because this delicious fruit is only ripe and ready to harvest for a few short weeks in January. So order your Honeybells before it's too late! I sent these to my next door neighbor. They were very pleased with these oranges. When received found in good condition, maybe one had a soft spot but found them good. Juicy and delivered on time! I placed two orders one for myself and the second sent to my mom for Valentine's Day. On both orders the oranges were very sweet and juicy, my only problem was I got two I had to throw out because it was spoiled and my mom had one that was spoiled when she received the package. I will not be using this company again.im giving it a four star rating based on the orange. After 2 shipments of Honeybells, these are definitely the juiciest fruit I've had with great flavor. Deliciously juicy! So good I ordered more. I'm on my third order through Gregorys today. The 1st order had some bruises but we're just as juicy but not as appealing. Regardless, I realized my hubby was eating them before I got any. He's never enjoyed them so much. I even sent some to my mom in Florida as a gift and she was delighted by them. Looking forward to my last order of the season.l but I'm sad at the same time. Less bruising in 1st order and I'd have given 5 Stars ..
as advertised. spend the extra on these. they were the best in 10 years. I will never go back to the regular. I sent these as a gift and got to sample a couple. A great treat and a lovely bonus gift! Unfortunately the honeybells we received were just ok. They were not super sweet like past honeybells we have had.i would say they were just average.